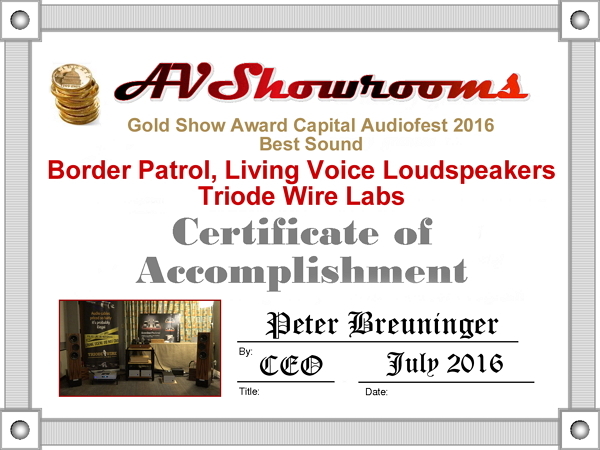 Gold Show Awards for best sound on the east coast, July 2016! 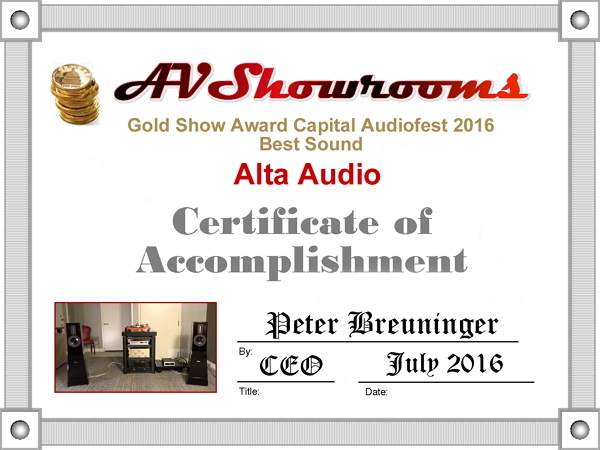 No surprise, but instead, much delight at the sound in the Alta Audio room. Alta’s Rhea two-way loudspeakers are simply another reason confirming my enthusiasm over two-way’s. 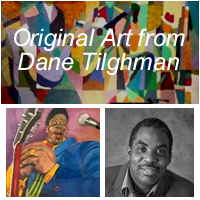 The sound was fast and detailed while maintaining an emotionally charged musicality. MA’s recording Sera Una Noche touched me as if I heard it for the very first time. Wonderful. 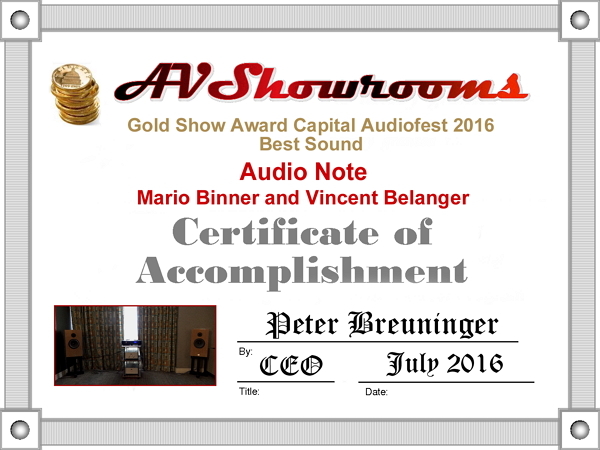 Affordable Audio Note gets you close enough to their pricey gear winning them another Gold Show Award for Sound. 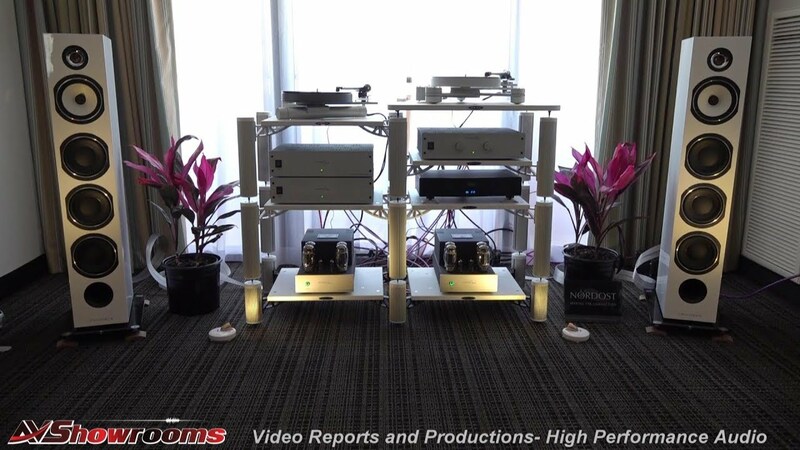 Mario Binner of Audio Note UK does a system walk-through on the soon-to-be-produced video and Vincent Belanger, Ambassador Audio Note Music, was playing the cello live accompanied by himself on the Audio Note System. This was an Audio Note “at its best” kind of day, the sound was clear, well integrated quiet and fast. The system sang with its signature sound defiant of any challenge that came its way by live musical performance. Gary Dews has it down where tubes are concerned. 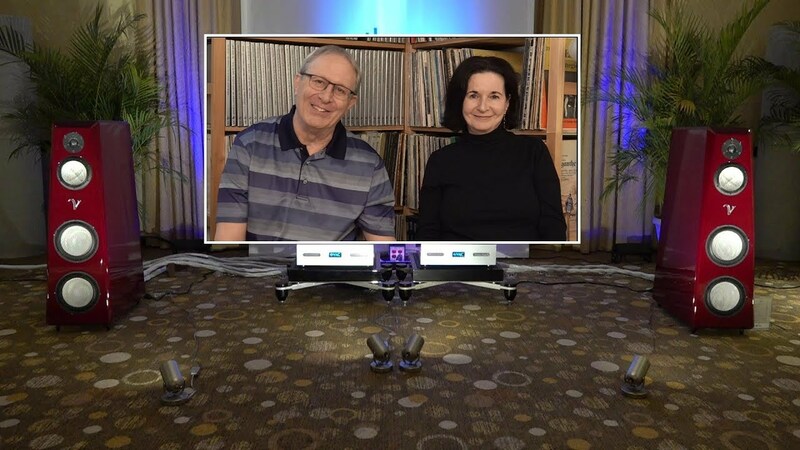 The room was dead quiet with Anne Bisson’s voice coming through with detail and delicacy through the Living Voice Loudspeakers. 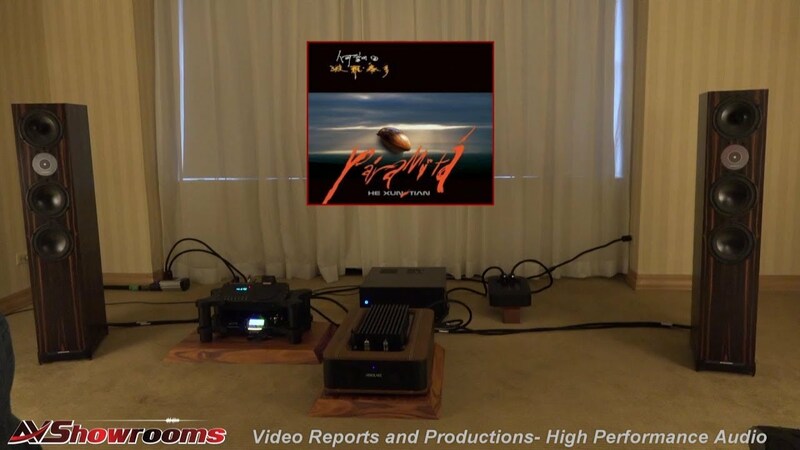 The room was wired up with Triode Wire Labs and I have to say it is amazing that this level of excellent sound can be had with cables at such great value. 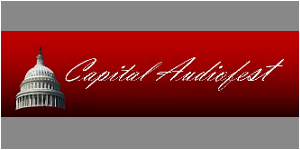 Sunil Lekhi, proprietor of Care Audio did not surprise me with superb sound because his rooms consistently have improved sonically over the years. It’s because Sunil really does care about achieving the best possible sound with carefully selected equipment. It’s a talent and it’s a passion resulting in a hyper-realistic, palpable sound that struck me before I even entered the room. 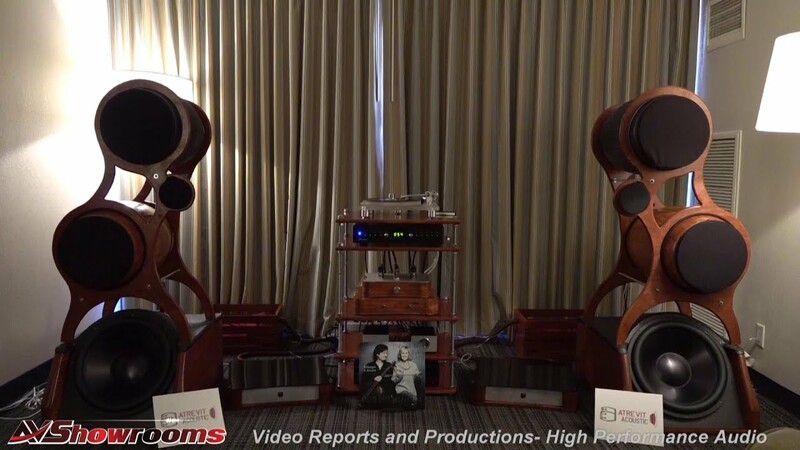 The room included MAD loudspeakers, electronics designed by David Berning, Wywires cables and the very impressive room treatments from Resolution Acoustics. 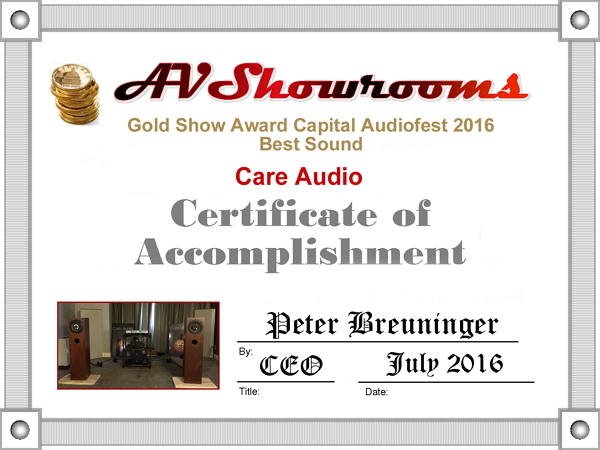 Every time I walked past the Classic Audio room in the two days I attended the show, the sound improved. John Wolff’s loudspeakers do something in the highs and the mids that draw me in like no other and the Hartsfields excel at reproducing female vocals and small strings. 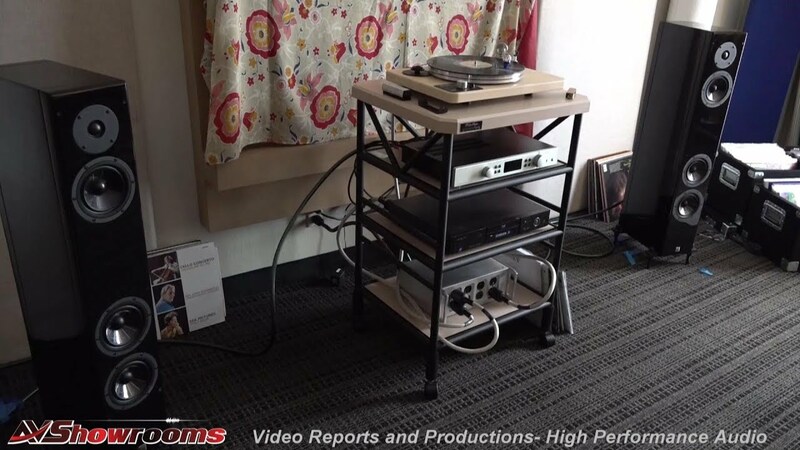 Don’t misunderstand, though, the sound was pulsating at high volumes when United Home Audio’s Greg Beron was spinning rock on his Phase 12 tape deck with power supply. The rock concert effect on the T-5.1 loudspeakers was very convincing and judging from the faces and responses from the attendees, I was not alone with that assessment. However, my preferred Classic Audio moment was on Sunday morning, when Greg played Ed Pong’s UltraAnalogue Recordings tape Beethoven Sonata for Violin & Piano 7. 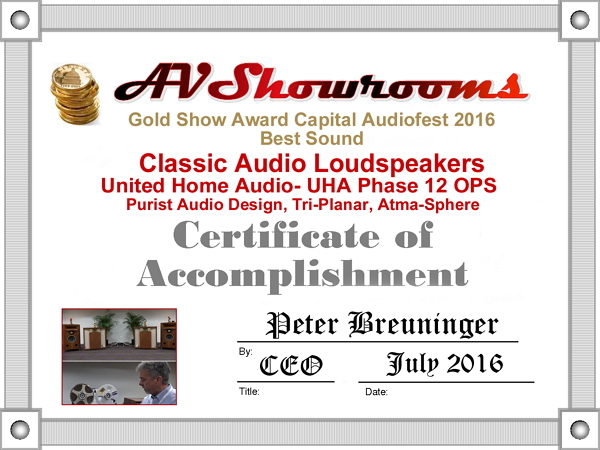 The separation of notes and instruments was so good it was startling; lightning fast and proper decay along with pinpoint imaging earned this stellar combination of Classic Audio wired with Purist Audio Design cables and United Home Audio a Gold Show Award for Sound. Can one rock to Beethoven? Yes, I say and yes, I did and we then exited the show shortly thereafter; me, still with a smile on my face. Rock on! John and Greg. Sit anywhere you choose, and Carl’s loudspeakers will bring music to you in a way that elicits a passionate response. Clear and emotionally charging mids and highs with a well-integrated bass produced some of the most realistic sound of the show. 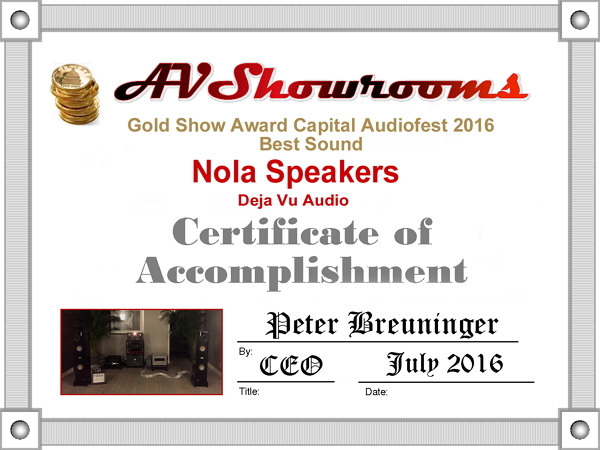 Open, big and realistic best describe the signature Nola sound. 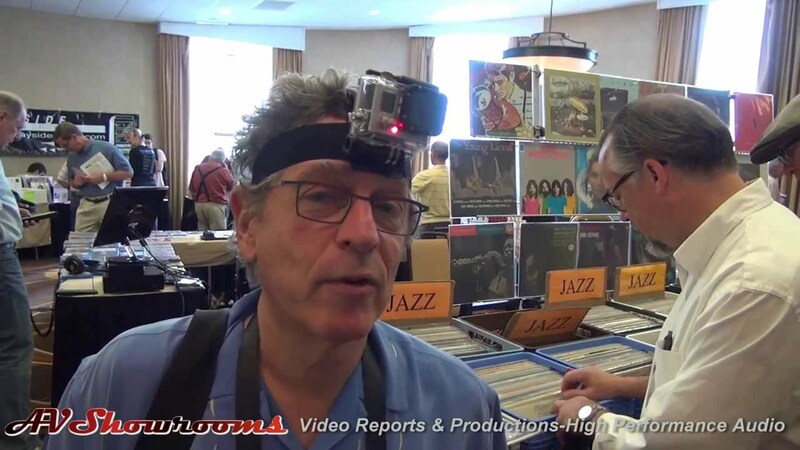 See you at the next show RMAF!